Rosemary Gibson has been credited with creating national movements for safer, more humane health care. Her first book, Wall of Silence, with co-author Janardan Prasad Singh, put a human face on medical mistakes, launching a national campaign to improve the safety of America’s health care. Gibson worked with Bill Moyers on the PBS documentary On Our Own Terms. She is a recipient of the Lifetime Achievement Award from the American Academy of Hospice and Palliative Medicine and is also the founding editor of a narrative series in the Journal of the American Medical Association (JAMA) Internal Medicine. She is senior advisor at the Hastings Center and the 2014 winner of the highest honor from the American Medical Writers Association. She is also the author, with Janardan P. Singh, of three other books on health care. 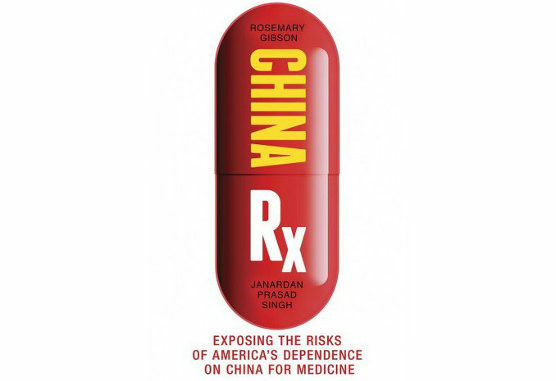 What Gibson and Singh describe is the extent to which American pharmaceuticals have become completely dependent on Chinese ingredients. First and foremost, this is a strategic question. Do we want to be wholly dependent on China for our antibiotics at the same time we are starting a trade war or having serious confrontations in the South China Sea? Second, there are serious quality issues. One of the reasons Chinese manufacturers can lower costs is that they are not subject to the same quality control and safety standards as US manufacturing. Yet American distributors are not disclosing this to doctors and pharmacies. Gibson and Singh begin the book with the story of an American doctor who was killed by improperly made heparin – there are reports of a significant number of similar deaths. The patient and his doctors did not think to ask where the drugs were from and whether they could be trusted. If you read China Rx, I am hoping you will start to take an interest and ask your doctor and pharmacy. The state of US pharmaceuticals described in China Rx is yet another example of the fact that the Wall Street-Washington model cannot and should not be trusted. No sense blaming the Chinese for our greed. It is our greed that is killing an increasing number of Americans. We have the power to do something about it.